So I love interior décor and I am always browsing pinterest and home decorating magazines for design inspo. I enjoy changing out our home décor with the seasons. 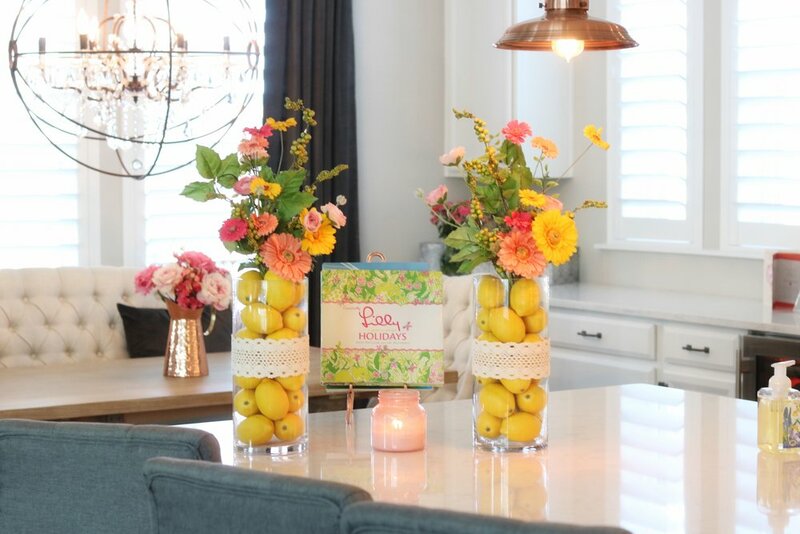 I was struggling with what to do for Spring and we recently visited our friends home and they had used Lemons in similar clear vases as décor on the kitchen island. For me though just having the clear vase with the faux lemons was a little to simple and reminded me more of summer time. I wanted to add some southern charm and glamour to the kitchen without being too over the top feminine. So what did I do? I went to Hobby Lobby of course as they are constantly getting in new items for the season and typically put their seasonal decorations on sale for 50% off and you can use a 40% off coupon from their website on anything that is not on sale.I stumbled across these beautiful peach, blush and yellow faux florals and the idea instantly came to me. I'm going to do the lemon filled vase with some burlap lace and these blooms in the middle. And walaa, they turned out beautiful. There you have it! So to start I picked up the two clear cylinder vases at hobby lobby, and they also had the bags of faux lemons that actually look very real. The trick is you have to find fruit that looks real or it will just look cheap and cheesy. I had to use three bags of 6 lemons per bag in each cylinder vase. so all together I used 6 bags of lemons for the two. Then I scooped up the lace and beautiful florals. I trimmed them so they would sit at a good height and used a hot glue gun for the burlap lace ribbon around each. I think the flowers and lace just add that extra charm for the blooming spring season. They also match my yellow Le Creuset cooker that I like to leave out on the gas range this time of year with my Lilly Pulitzer seasonal cook book. Let me know if you have any questions or re-create this look! Would love to see!